InterContinental Fiji Golf Resort & Spa is delighted to announce their win as Australia & Oceania’s Luxury Golf Resort at the 2018 World Luxury Hotel Awards™ Gala Ceremony hosted on 10 November 2018 at the Ayana Resort & Spa in Indonesia. 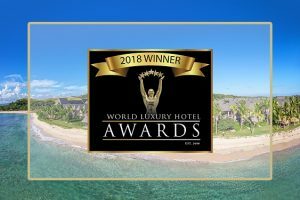 “Complementing our recent win as Haute Grandeur’s Fiji’s Fiji’s Best Beach Resort, Fiji’s Best Golf Resort, Fiji’s Best Resort Spa and Fiji’s Best Destination Wedding Retreat 2018; this award also reflects our dedication to golf excellence. With the hosting of the 2018 Fiji International presented by Fiji Airways tournament, we had the opportunity to deliver and showcase our unique Fijian culture and unmatched location on the best beach on the main island of Viti Levu to an increased audience on the world stage,” says Andrew Davidson, Area General Manager South Pacific at the InterContinental Fiji Golf Resort & Spa. “Establishing Fiji as a world class golfing destination takes dedication, teamwork and a lot of attentive care from our team. Offering ample facilities that complement a golfing holiday with downtime is key to what makes our Resort truly exceptional. There is something for everyone to enjoy; from relaxing poolside, exploring the beach to a pampering massage at our award-winning Spa, ensuring that our guests leave with fond memories to last a lifetime,” said Mr. Davidson. The InterContinental Fiji is also the official host resort partnered with the Fiji International presented by Fiji Airways golf tournament; a tri-sanctioned ISPS HANDA PGA Tour of Australasia, European Tour and Asian Tour that just completed its fifth year at the Natadola Bay Championship Golf Course. The 18-hole renovated golf course is designed by renowned golfer Vijay Singh, and now boasts some of the best greens and fairways with stunning views of rolling greens complemented by the South Pacific Ocean.